The dynamically angled profile of this black picture frame is highly contemporary and with brushed gold on the inner lip, it’s a classy, timeless picture frame. It’s also canvas friendly for your next painting, photo frame (a Photographer’s favorite! ), family photo frame, wedding frame or gallery frame. Satin finish. Handmade by our Artisans from natural, sustainably managed wood. Customize your size to 1/8th of an inch! Well packaged, precision fit, very pleased with the result. Pictures look amazing ! Frame looks classy and timeless . Great, Great Frame - LOVE IT! This frame was exactly what I was looking for - elegant but with a rustic touch. It accented my painting perfectly! This frame is sturdy and corners meet nicely. Custom sizing is nice option as well especially for the price. It could have gone really bad...but it didn't. This is a beautiful frame. My first one arrived broken. When I contacted them, they apologized, and sent a replacement immediately. I am so pleased withe the quality. The picture doesn't do the black against the gold justice. I needed to frame a small 10x10 oil painting and was given a quote of hundreds of dollars by a local framer !! But an artist friend suggested pictureframes.com ... I was thrilled with the frame I selected...both the value and the speed of delivery and even the packaging . I am eager to get some other art reframed now! Fit like a glove and looks like a million bucks. 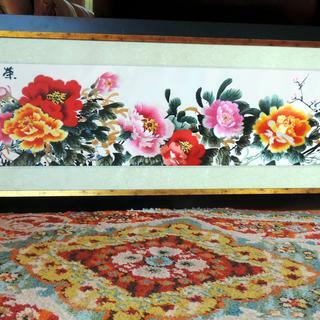 Just right to display the ultra-wide precious hand-embroidered tapestries we brought back from Vietnam. Excellent quality and appearance, and easy-to-complete mounting hardware. Glad we ordered the non-glare acrylic. bought 2 frames. which were well constructed and the mats were cut to the correct size. Thank your for your review. I am sorry to hear that this was not what you expected. We do offer samples in the future if you are interested in seeing a frame before purchase. If you are dissatisfied we are more than happy to offer you a return on the product. Our phone number is 1-800-332-8884. 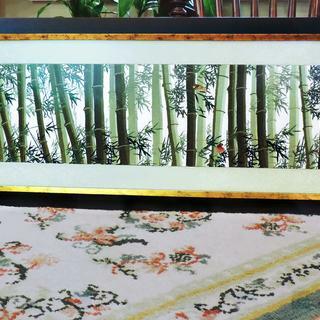 It's a versatile frame that works well with most of the pictures I paint. This frame is to go over a large mirror in my guest bathroom. The colors match my current decor. Goes best with the colors in the oil painting. Nice contrast with antique gold and refined black. It's a classic frame and goes with many paintings. I've bought it over and over for my artwork. to replace cheaper quality frame I now have. Love the gold detail on this one. I selected the gold and black frame because there is just a bit of gold and also a touch of black in the painting. The presentation should be exquisite. Are these heavy? Any idea how heavy a 30x20 frame might be? BEST ANSWER: I have a very large frame. It is securely attached to the wall because we are in earthquake country, and I bought almost three years ago. I do not remember how heavy it was. We used two gorilla hooks and that is more than sufficient. I can tell you it is very attractive, but I would think they are in a better position to give you the exact weight. if that answers the question better. I don't have a scale but by comparison to other 24"x36" frames I own this is not heavy at all. Just feels right. Any lighter and it would seem cheap to me. Really a pretty high end frame! I just used this for a show in London and it looked fantastic. No, not very heavy. I have bought three of these in different sizes but none as large as 30x20. Still, I don't think these would be heavy even that large. Hope this helps. I've only gotten 9x12 frames, but they are not too heavy. Not like those really deep thick frames. I use this frame a lot for my landscape paintings. Love it! My frame is for a 24x18 piece and weighs 4.5 pounds with the art in it, but no glass. The frame itself is very light weight material. I've not ordered anything that big but have used smaller versions of this frame a lot. It's a nice weight but not overly heavy. The 11 x 14 was the largest I got. It was not heavy because there's no extra molding. It is ver light. No worry about the physical weight. They are lightweight wood not too heavy at all.